Alciato at Glasgow: Emblem: Vespertilio. Hunc hominem potuit commaculare nota. Writers tell us that Chaerephon, Socrates’ follower, got his particular name from the winged daughter of Minyas. It was his sallow complexion and squeaky little voice that gave rise to such a slur to sully his reputation. 1. For the transformation of the daughters of Minyas (the founder of the earliest race of Greeks) into bats - for refusing to worship Dionysus - see Ovid, Metamorphoses, 4.389ff. 2. 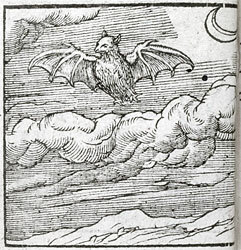 Chaerophon, a distinguished disciple of Socrates, was nick-named ‘The Bat’ and ‘Boxwood’ for his pale complexion and poor health, supposedly brought on by excessive study. See Aristophanes, Aves, 1564; Philostratus, Vitae sophistarum, 1.482.